Our ability to hear and maintain balance relies on thousands of sensory hair cells in various parts of the inner ear. On top of each hair cell is a group of tiny hair-like structures called stereocilia, also called a hair cell bundle. When triggered by sound, head movements, or other input, the hair cell bundles bend, opening channels that turn on the hair cells and create electrical signals to send information to the brain. These signals carry, for example, sound vibrations so the brain can tell us what we’ve heard or information about how our head is positioned or how it is moving, which the brain uses to help us maintain balance. NIDCD researchers Doris Wu, Ph.D., chief of the Section on Sensory Cell Regeneration and Development; Katie Kindt, Ph.D., acting chief of the Section on Sensory Cell Development and Function; and Tao Jiang, a doctoral student at the University of Maryland College Park, sought to describe how the hair cells and hair cell bundles in the inner ear are formed by exploring the role of Emx2, a protein known to be essential for the development of inner ear structures. They turned first to mice, which have been critical to helping scientists understand how intricate parts of the inner ear function in people. 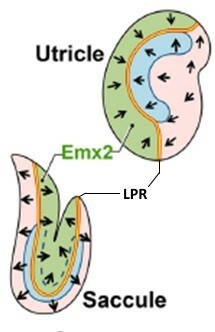 Line of polarity reversal (LPR) and location of Emx2 within two inner ear structures. Arrows indicate hair cell bundle orientation. Each hair cell bundle in the inner ear bends in only one direction to turn on the hair cell; when the bundle bends in the opposite direction, it is deactivated, or turned off, and the channels that sense vibrations close. Hair cell bundles in various sensory organs of the inner ear are oriented in a precise pattern. Scientists are just beginning to understand how the hair cells determine in which direction to point their hair cell bundles so that they perform their jobs. In the parts of the inner ear where hair cells and their hair cell bundles convert sound vibrations into signals to the brain, the hair cell bundles are oriented in the same direction. The same is true for hair cell bundles involved in some aspects of balance, known as angular acceleration. But for hair cells involved in linear acceleration—or how the head senses the direction of forward and backward movement—the hair cell bundles divide into two regions that are oriented in opposite directions, which scientists call reversed polarity. The hair cell bundles face either toward or away from each other, depending on whether they are in the utricle or the saccule, two of the inner ear structures involved in balance. In mammals, the dividing line at which the hair cell bundles are oriented in opposite directions is called the line of polarity reversal (LPR). Using gene expression analysis and loss- and gain-of-function analyses in mice that either lacked Emx2 or possessed extra amounts of the protein, the scientists found that Emx2 is expressed on only one side of the LPR. In addition, they discovered that Emx2 reversed hair cell bundle polarity by 180 degrees, thereby orienting hair cell bundles in the Emx2 region in opposite directions from hair cell bundles on the other side of the LPR. When the Emx2 was missing, the hair cell bundles in the same location were positioned to face the same direction. Looking to other animals to see if Emx2 played the same role, they found that Emx2 reversed hair cell bundle orientation in the zebrafish neuromast, the organ where hair cells with reversed polarity that are sensitive to water movement reside. These results suggest that Emx2 plays a key role in establishing the structural basis of hair cell bundle polarity and establishing the LPR. If Emx2 is found to function similarly in humans, as expected, the findings could help advance therapies for hearing loss and balance disorders. They could also advance research into understanding the mechanisms underlying sensory hair cell development within organs other than the inner ear. Contact the NIDCD press office at 301-827-8183 or news@nidcd.nih.gov.